This product comes in a color version and a print_friendly version. Each contains 73 maps and the color version has links from the maps to the text. Each of the maps are done on separate pages to make them easier to see. 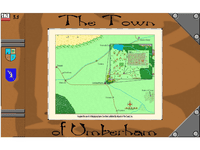 The Town of Umberham includes the color cc2 maps which are viewable and printable with the free CC2Viewer/Printer from ProFantasy http://www.profantasy.com.